*click here* for the most recent updates. 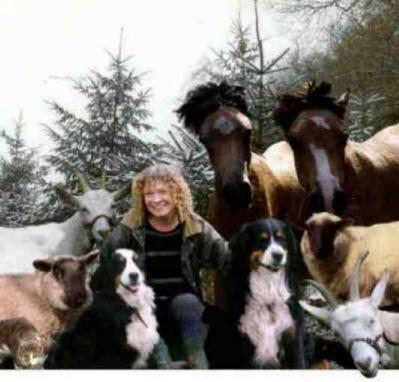 This picture was compiled for my Christmas Card in 1998 by my very good friend Marian Wilding-Jones and shows me with my gang at the time. 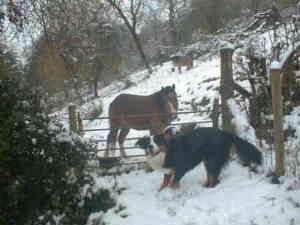 My two Bernese Mountain Dogs, Sunny and Sam; my goats, Abbi and Elli; Welsh Mountain Ponies, Arthur and Andy: two ewes, Hoppy and Poppy, and lurking in there, my three cats, Pipsqueak, Sooty and Snowflake. Since then so many things have happened. Sadly, Samson developed T Cell Lymphosarcoma in the Spring of 1999 and after a very brave fight lost his life on September 30th that year. He was and still is so much missed by us all. Then Monster BMD Pup, Simeon, joined the Gang in October '99 and grew as fast as he could to fill the empty space in our hearts. Here's Simmy at just seven weeks! 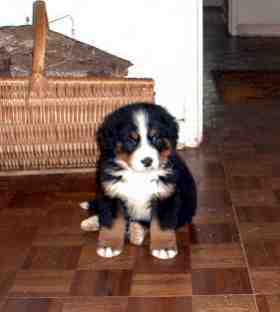 In June 2002 we also adopted, Barney, our third Bernese Mountain Dog. The Gang is ever expanding! In September 2004, we were again to face a very difficult time. Shortly after his fifth birthday, Simmy was suddenly off his food and lost weight rapidly. The most dreaded diagnosis of all, Malignant Histiocytosis. Simmy died within a very few short weeks, we were all stunned at losing this Boy so very fast. I had been running a website, Histio Roll Call, for two years previously in conjuction with many fundraisers for research into this awful cancer. 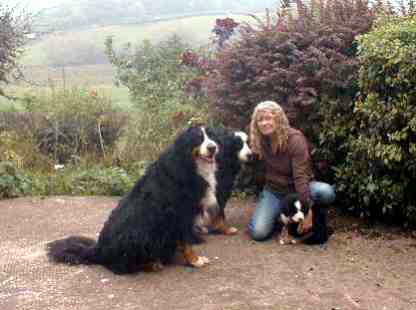 MH is currently affecting many of our Bernese Mountain Dogs from all over the world and it is heartbreaking to lose a young dog so very quickly. Adding Simmy's page to this Roll Call was one of the hardest things I have ever done. October 11th 2005 - a year later - we grieved so much for Simmy, but a few weeks ago we celebrated Sunny's 11th Birthday and last week collected a new Bernese Pup, Sunny's Great/Great/Niece to join the Gang. Once again we have sweet Berner puppy breath and new hope here at Longlease. 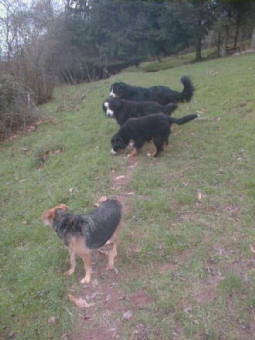 December 2005 and we have our neighbour's terrier, Spike, come to visit for a while, here we are setting off for our walk in the woods. Pixie has grown so much! "Come on, Spike! We're going this way," says Sunny. 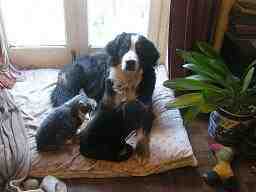 November 5th '06 and seems we now have a new member of the Gang! Spike has been staying with us for the last few months was supposed to be for a few weeks? with wanna- be-a -Berner, Spike! 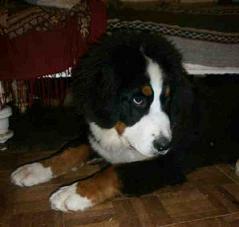 At the moment we have just the one Bernese Mountain Dog, Miss Pixie, now two years old. Pixie and I go walking! 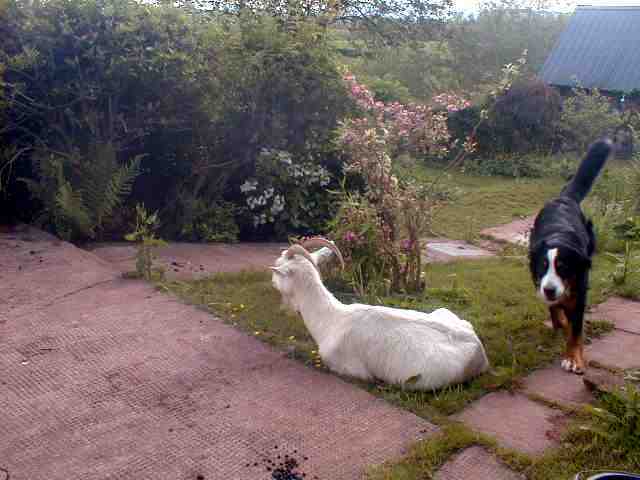 Sadly in March 2008 we lost Abbi Goat aged 14 yrs though Elli continues to do well, she has been missing her sister though and the past few months has been choosing to hang around with us. Jan. 4th 2010 - Our Indoor Gang is now just Pixie, Pipsqueak and Sooty. We hope that this new year will bring us good fortune and new members to replace our so very sad and recent losses. Our two ponies, Arthur and Andy, continue to do well now both aged 14 yrs and we currently have three ewes, Ella aged 10 yrs, Rosie aged 4 yrs and Rosemary coming up to 2 yrs old. May 18th 2010 - Introducing Herb our new Bernese Boy! He came for two weeks but will be staying! With many thanks to June Miles for entrusting the care of this very precious boy to us. He and Pixie have been having so much fun together. Herb has been with us just a few short weeks but it feels like he has always been here. July 31st 2011 - Introducing our new Berner pup, Ida. Life is looking up here at Longlease! This latest addition to our Gang is Herb's granddaughter. We are a three Berner household again for the first time since Sunny died in 2006. So many wonderful memories of this very special Gentle Giant! So many wonderful memories of this very special girl! Our indoor Gang is now Berner girl, Ida, and Little Miss Purdy. Our outdoor Gang, Arthur and Andy, Welsh Mountain Rescue Ponies are still doing well! 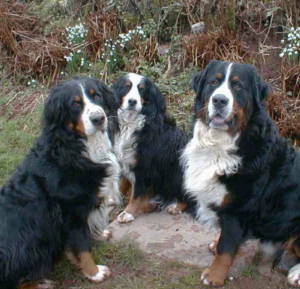 Check out the links below and explore the Site to see the pictures of all my Bernese Mountain Dogs and the other members of the Longlease Gang over the past many, many years. So many happy times though at times shadowed by such sadness. 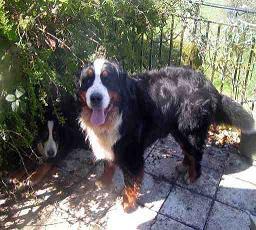 Check out the "Friends' Gallery" where you will find pictures of Bernese Mountain Dogs and a whole load of other critturs too from all over the world who have become our very special friends. Enjoy the "Humour" and "Berner Fun Stuff" pages and explore the "Links" to many other great animal sites. On the "Articles and Info" page I will continue to add information concerning all aspects of living with a Bernese Mountain Dog from breeding to feeding, most recently the links re. canine cancer care. The "Bernese Art" page is updated with links to the very best animal animal portrait painters and "Berner Shop" with links to the very best Berner Goodies around. On the "Berner Fundraisers" page you will find links for the latest fundraisers being held worldwide on behalf of the breed, please donate generously. These fundraisers help so very much in so many different ways, from helping fund that so very important database from Berner-Garde, to Rescue Work and even funding Research for cancers in the Breed. By donating just a small amount you can do so much to help here and there are some fantastic prizes to be won! 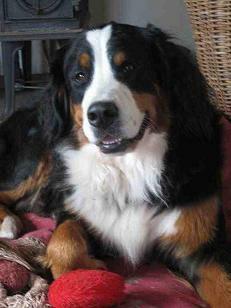 Another recent addition to this site is the "Berner Veterans" page, there has been so much concern about the short life expectancy of our Berners recently, I felt it was time to make a special place to celebrate the life of those Bernese Mountain Dogs who make it into double figures, any of you who have or have had a Berner achieve 10+, let me know! 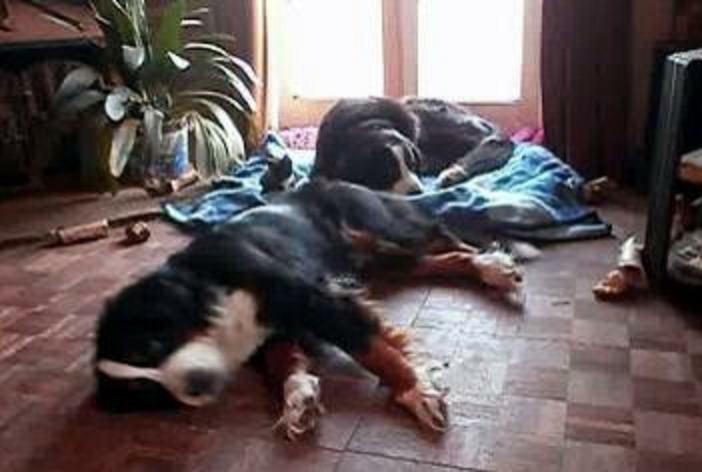 Bookmark this page, "Longlease Bernese Mountain Dogs" and keep up with the current adventures of Bernese Mountain Dogs, Pixie, Ida and the rest of the Longlease Gang and the latest additions to our site! And BTW don't forget to stop by and sign the "Guestbook"! Enjoy your visit and keep those pics coming in!